The polling organization Gallup published some encouraging news recently: Nearly 60% of Americans say they’re earning more money now than they were five years ago. In normal times, that would be unremarkable. But in today’s punishing economy, it ought to be cause for celebration. There’s a problem, though: The most reliable data show that incomes have been falling, not rising. The latest numbers show personal income rose just 0.1% from June to July, with wages and salaries declining by 0.3%. Longer term, a recent report by Sentier Research, based on government data, found that median household income, adjusted for inflation, has fallen by 4.4% since the recession officially ended in June 2009. Going to back December 2007, when the recession officially began, real median income has fallen by 6.1%. 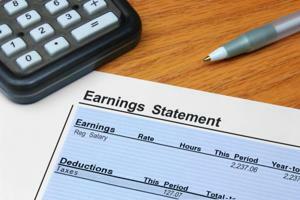 So why do Americans think their earnings are going up, when data show they are not? The “wealth effect” probably has something to do with it. The twin housing and stock market busts nuked more than $12 trillion in wealth from 2007 to 2009. Financial assets began to recover in 2009, when the stock market bottomed out and started a bull run now in its fifth year. Home values dropped from 2006 until last year, but they’re rising sharply now. As a result, Americans’ total net worth finally eclipsed the prior high, from 2006, earlier this year. Recovering lost wealth makes people feel better off – and perhaps creates the impression they’re actually taking home a bigger paycheck. That has been reflected in consumer confidence, which has drifted upward (in herky-jerky fashion) despite worries including tax increases, government spending cuts, debt woes in Europe, and changes in Federal Reserve policy and leadership. Inflation can trick people, too. When most people get a raise or earn more, they don’t discount it by inflation to gauge whether they’re really getting ahead. Since December 2007, cumulative inflation has run at about 10.3%, which means if you earned $50,000 per year back then, you’d have to earn about $55,150 today to have the same purchasing power. Since June 2009, cumulative inflation has been about 8.6%, so $50,000 then would be the same as $54,306 today. The government numbers on median income are already adjusted for inflation, by contrast. So it’s possible to get a raise but still fall behind, without really noticing. There are also fewer people earning a paycheck these days. The Gallup survey with the hopeful earning numbers only includes people with a full- or part-time job. The government’s data, by contrast, measures income for every household, even ones in which nobody has a job. That reveals a troubling bifurcation of the U.S. economy. Many people with jobs are doing okay, as the Gallup data suggest. For them, the risk of layoffs is abating, job security is improving, and they are starting to feel more optimistic about the future. When you include everybody who’s unemployed, however, the picture darkens. Total U.S. employment is still more than 2 million jobs below where it was at the start of 2008, and it’s lower still when compared with what it ought to be given population growth. That adds up to a lot of people whose income has plunged, which the government numbers do capture when estimating median household income. There is broad agreement on one thing, whatever the numbers show: Americans aren’t earning enough to support a robust economy. “We’re in an income depression,” says John Coder of Sentier Research. “Incomes have been flatlined for a very long time.” Maybe Gallup should conduct a poll asking people whether they need more money. Those results would be unamibiguous.